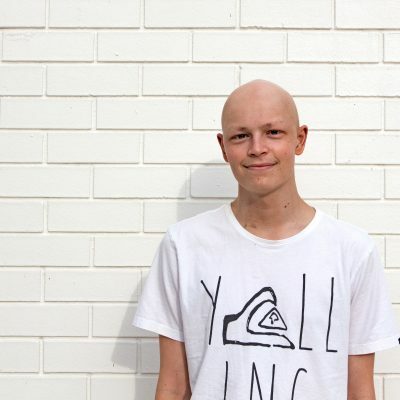 Baxter Hutchinson is an ambassador for Minderoo Foundation’s Eliminate Cancer Initiative. Baxter is bravely sharing his cancer journey with us in three parts, starting with his diagnosis and surgery. Baxter Hutchinson receiving treatment in 2018. Photo Credit: Caz Hutchinson. On the 15th September 2018 I was diagnosed with two medulla blastoma brain tumours, and so began one of the biggest challenges of my life. The diagnosis alone was a lot to take in. I had never heard of brain cancer because it is so rare and that brought on a massive fear of the unknown. The doctors at Murdoch hospital told me that I would have to have brain surgery just five days later. We didn’t know then that it would become one of the most radical brain surgeries ever performed. The 20th of September came quickly. Dr. Narulla was set to be my surgeon. At 1:30pm I was taken in for surgery and given general anaesthetic so they could begin the procedure. After an 11 hour surgery, that was initially estimated to take only five hours, I was brought round. The tumour wrapped around my brain stem had been completely removed but the other was declared inoperable. Dr. Narulla had completed my surgery almost to perfection, despite the anaesthetist having to bring me back to life twice during the procedure. I woke up unable to feel my arms and legs. I couldn’t see or swallow. I was moved from hospital bed to hospital bed and was finally settled in the intensive care unit (ICU). There I was placed on a drip involving a concoction of drugs and heavy steroids. I regained movement of my arms and was beginning to feel my legs. However, I was still unable to walk, swallow and had double vision so bad I couldn’t see. Weighing in at only 47 kilograms I still had a long road ahead of me. Of my 14 days in ICU, all I can remember is the horrible hallucinations and my inability to sleep for 11 of the days I was there. After two weeks I was released from ICU and taken to St. Katherine’s ward where my recovery began. On the 24th of September I took my first few steps since the surgery and slowly began to learn how to walk again. Tash my physio began to see me nearly every day, helping me improve my strength and technique. I swallowed for the first time on the 7th of October and had my first liquid meal three days later. My swallowing then regressed as an x-ray revealed that due to nerve damage, my food was getting stuck in my throat. I had to meet with a speech pathologist named Lee who began exercises with me to improve my throat strength so I could push food down. That followed with beginning some simple eye exercises to improve my vision and strengthen my eye muscles which had received nerve damage in surgery. When faced with re-learning what had once been second nature, I realised my perspective on life had changed. My focus was now to become strong, fit and healthy, ready to tackle stage two: radiotherapy. Baxter Hutchinson is an ambassador for the Minderoo Foundation’s Eliminate Cancer Initiative. He connected with Minderoo through his fundraising efforts for Cure Brain Cancer Foundation’s Walk for a Brain Cancer Cure, after he was diagnosed with Brain Cancer in 2018. Baxter’s goal is for people to understand the complexities of brain cancer and to pursue further avenues for funding and research. Baxter is currently completing a ten week flexi-track course with the aim to study sports science at Murdoch University. He can’t wait to get back on the soccer field.